Wearing sandals is a sure sign of warm weather. Unfortunately, with sandals comes the inevitable odor that is caused by the bacteria from bare feet. Depending on what the sandals are made of, there are ways to wash sandals to minimize the bacteria and odors that accumulate over time. Learn how to wash the soles of sandals to keep summer sandals smelling and looking sweet and clean. Place sandals made of synthetic materials such as plastic or rubber in a bucket of water mixed with dish washing soap. Allow the sandals to soak for 24 hours. Remove them and scrub the soles well with a toothbrush or a cloth. Rinse the sandals with clear water and allow the sandals to dry completely. Wash sandals made of leather in the cold water, gentle cycle of the washing machine. 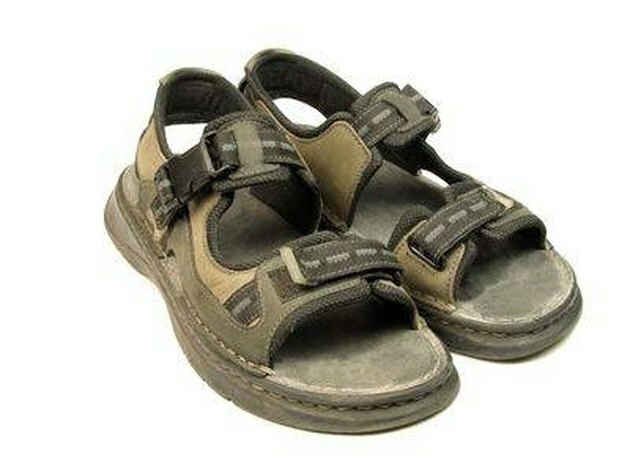 Use a small amount of detergent and then allow the sandals to air dry completely. This method will work well for many different types of leather sandals. The key to washing leather is to make sure that the entire surface of leather is exposed to water evenly so that there will not be uneven discolorations after the leather dries. Rub saddle soap into the surface of leather soles if washing in the washing machine is not desired. Saddle soap is designed to clean leather surfaces without water and can restore and clean leather surfaces. Buff out the saddle soap with a clean cloth to finish. Scrub a water-dampened toothbrush sprinkled with baking soda into the sole surface of plastic or rubber sandals. The baking soda's abrasiveness should effectively clean dirty surfaces and can also help to minimize bacteria and odors. Rinse the sandals with clear water and allow to dry completely.